take a big swig of red wine, chew, grumble. Jon: "Not pizza." Swallow, swallow, swallow, flip the channel to check the basketball score, growl, swallow, sigh. 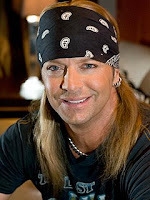 Jennifer: "Do you think Bret Michaels has any hair under that bandanna?" Jennifer: "What is this?" I ask again as I finish my last slice of undersauced, undergrilled, underflavored cardboard. Jon: "Not pizza. We won't be trying this place again." We can barely look each other in the eye. It would've been quite apropos if "Another One Bites the Dust" was a Poison song, but it's Queen. I was truly hoping for a new explanation that time, like an introduction to some trendy new food I should've known about. The not good to very bad pizzas we keep trying are kind of like Bret Michaels' reality show. I keep watching because I hope he'll find the woman who'll finally satisfy him, and the journey is entertaining. And I keep ordering because I hope to find the pizza that will be the cherry on the sundae that is New Orleans. Pizza is one of the few things that I miss about living in New York (though the weather's been so warm Pinkberry's started to slip back into my thoughts...). But then, just like NYC's pizza is so much better than Nola's, one note from Freddy Mercury's beautiful mouth was better than any album Poison ever produced. So maybe the two shouldn't be compared. Similar to some of the women who appear on Michaels' "Rock of Love" series, after trying at least four different "pizza" shops in Nola, I've started to get desperate. To the point of considering booking a trip to La Guardia, cabbing it straight to John's, eating a 12-slicer myself, and then bringing a few pizzas home with me to freeze. "What's that great smell, did you make homemade pizza?!?" Jon will say as he walks in the door from work. "Ur, um, yes, and, I'm sorry about the grocery bill but the pizza ingredients cost $350 roundtrip...but try a bite, it'll 'rock your world'!" "What do you mean 'roundtrip?'..." Cue "Every Rose Has Its Thorn." sorry about the cruddy pizza :-/ maybe you can get some shipped?? brilliant! Although I really hope the pizza isn't as skanky as those skankity skanks on the bus.